Great trail all the way to Gem lake. Only hazards were some slippery wet rocks and muddy patches on the trail. Parked at Alpental ski area parking and took the Snow lake trailhead (3100'). 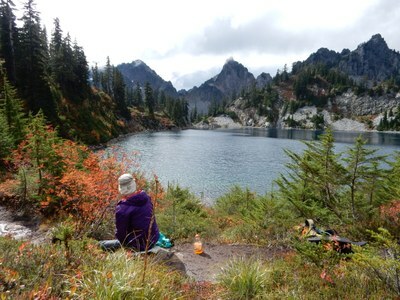 Need to sign in and carry the Alpine Lakes Wilderness use permit, which are in boxes at the trailhead. Weather was much better than expected; with 70% chance of rain but there was no rain on this trip. Total mileage was 10.17 miles, 2877' elevation gain - all according to my GPS. Elevation at Gem lake is 4857'. Total time was 7 hours roundtrip; 3 hrs & 15 mins going in to the destination - Gem Lake.